Sometimes a telling story emerges virtually by accident. That’s what happened with our report on teacher attrition at turnaround schools, published in this issue of Catalyst In Depth. Deputy Editor Sarah Karp was poring over state teacher service records and noticed that, surprisingly, teacher turnover didn’t end once a turnaround was in place. Not only did most existing teachers disappear with the turnaround—a process that requires teachers and other staff to reapply for their jobs—but most of the hand-picked teachers who replaced the veterans quickly vanished too. Karp interviewed a number of former turnaround teachers who described constant pressure to raise test scores, work long hours, adhere to checklists for how classrooms and bulletin boards should be decorated and maintain strict discipline. Hallways were to be at “zero,” completely silent, at all times. Though we were surprised by the findings, many of our readers were not. Dozens of them weighed in and posted comments on an abridged version of Karp’s article published in April. Many of the comments were written by former turnaround teachers who expressed relief at escaping from the high-pressure turnaround culture. In one comment, a reader questioned how such a mass exodus could be taking place given the contract requirements of the Academy for Urban School Leadership (the teacher training program that manages all but a few turnarounds). 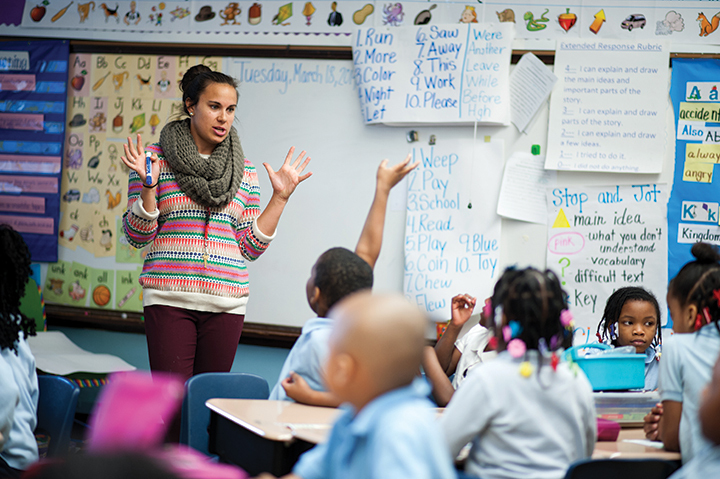 Teachers must agree to work in CPS for several years after completing their AUSL residency. Yet experts point out that high teacher turnover has the worst impact on poor children of color, the very children enrolled in turnarounds. On a broader scale, any good business leader—and today’s education reformers like to espouse business principles—will say that constant workplace turnover is costly and a likely sign of subpar management. So far, most turnarounds have made only modest improvements on state tests. How can teachers create meaningful change when they’re out the door almost as quickly as they arrive and never get the chance to become part of a stable community of dedicated educators, working with the community to create a truly high-quality school—not just a quick uptick in test scores? In CPS as a whole, annual attrition is 18 percent. Of those, about 40 percent of teachers transfer to another CPS school, but a growing number head for suburban districts. And as the Consortium on Chicago School Research has shown, turnover is worst where poverty is highest. Catalyst’s analysis found that among 132 schools where more than 90 percent of students are low-income minorities, a third of schools lost more than half their teachers between 2008 and 2012. Part of the problem is the stress and, for many new teachers, the culture clash of teaching in a school surrounded by entrenched poverty. Sending rookies, fresh out of school and usually white and middle-class, into a failing school in East Garfield Park or Roseland is almost inviting them to crash-and-burn. Smart educators know that it takes a particular outlook and sense of dedication to handle these jobs. The late University of Wisconsin professor Martin Haberman, for one, pioneered a protocol for selecting teachers with the personal qualities necessary for teaching in urban schools. Cultural competence is essential, too. At the University of Illinois at Chicago, students in the School of Education complete service projects before they start student teaching. Dean Alfred Tatum theorizes that showing students the power of changing children’s lives will help provide an incentive for them to stick with it when the going in urban schools gets tough. Tatum also recruits black male high school juniors for a leadership academy that includes tutoring for elementary students. The hope is to draw some of these young men into teaching, a profession that is in dire need of more black males. “You have to ignite that fire in them, and keep it lit,” Tatum says.